Chicken Salt is a gluten-free and MSG-free vegan all-purpose seasoned salt with a unique and savory chicken flavor, but is 100% animal-free, too! With a blend of sea salt, herbs and spices, Chicken Salt makes any dish burst with flavor. 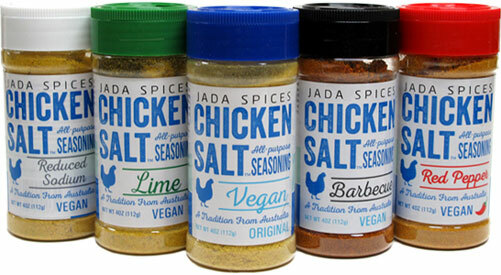 It's Australia's favorite seasoning, finally available in the USA, so sprinkle it in your favorite dishes while cooking, top off your popcorn or french fries, use as a rub for your meat alternatives, flavor soups, stocks and veggies....your imagination is the limit, so put a dash of Chicken Salt on your favorite foods and find out just how much tastier they can be! Chicken Salt is available in 5 tasty varieties, including Original, Reduced Sodium, Barbecue, Lime, and Red Pepper. 4 oz. (113g) shaker bottles are $6.99 each. From Anonymous of St martinville, Louisiana on 8/3/2018 . A little less salty that the packets in the well known ramen packs.